VERNON - Republicans won a decisive victory Tuesday over Democrats, with Jason L. McCoy taking the mayor's job from Ellen L. Marmer and other party members winning all possible seats on the council and school board. With 42.44 percent of voters casting ballots, Republicans saw it as a mandate. McCoy, a 36-year-old local lawyer whose grandfather was a multiterm mayor in the 1970s, handily defeated Marmer, a two-term incumbent, and is now looking toward the future. "We've got to get to work now," he told the jubilant crowd celebrating Tuesday at Republican headquarters after the polls closed. "We've got a lot of cleaning up to do." McCoy said he and the Republican-led Town Council would meet soon to discuss the direction they'd like to take, but he expects that better communication and cooperation would be the key elements of the new boards. 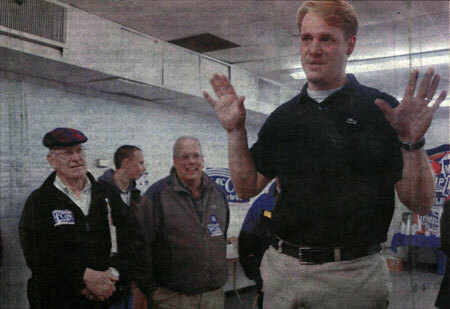 Vernon Republican Jason McCoy speaks to supporters Tuesday at party headquarters. McCoy defeated Democrat Ellen Marmer for the mayor's seat. "But absolutely the big issue is spending," McCoy said, adding that he would try to keep his budget proposals to a 3 percent increase. "People are not happy with overspending." Once the budget is taken care of, "then everything else will fall into place," said McCoy, who joined the council in 1999 after losing three elections for a state legislative seat. Republicans who gathered at the downtown Rockville storefront Tuesday were in shock as results came in - not that they won, but that they won by so much. "This is just unbelievable - Diane Wheelock even got more votes than Marmer," returning Town Councilman Daniel E. Anderson said. She wasn't alone. Every single Republican candidate did better than the 68-year-old mayor, a pediatric cardiologist, by at least 695 votes. Out of 14,974 registered voters, 8,612 ventured out to the polls to cast a vote. Besides the mayor's race, voters also chose eight Town Council members and filled four Board of Education seats, giving majority rule to Republicans in both cases. Of the votes cast for mayor, McCoy took 3,741 to Marmer's 2,465 - a difference of 1,276 votes - handily beating Marmer in all six districts. Petitioning candidate James W. Wilson was not a factor in the mayoral race, with only 93 votes. 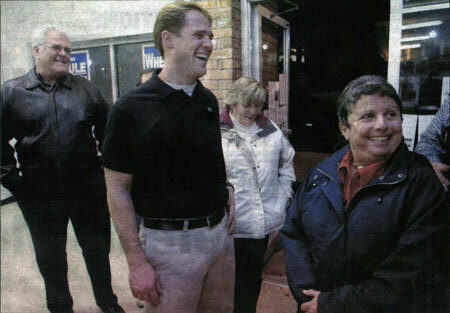 Vernon Mayor Ellen Marmer, right, smiles as mayor-elect Jason McCoy, center, looks on Tuesday at Republican headquarters in Vernon. Marmer broke the pattern of mayoral turnover in 2003 by being the first Vernon mayor to win re-election in 14 years, beating Wheelock by only 26 votes. Marmer led a group of Democrats over to Republican headquarters Tuesday shortly after the numbers were tabulated to congratulate McCoy and his team. "The people have spoken," Marmer said on her walk over. "I'm still going to be passionate about this community. I ran to make a difference, and the evidence is all over town. I can only hope they continue with that. "It was tough getting re-elected, but a three-peat was going to be an impossible dream," she added. The only Democrats returning to the Town Council are Phyllis Schaefer, Marie Herbst, and Bill Fox. Newcomer Michael Winkler will join them, along with returning Republicans Brian Motola, Bill Campbell, Daniel Champagne, Mark Etre, and Daniel Anderson. Rounding out the new council are Republican newcomer Nancy Herold, Wheelock, and former school board member Peggy Jackle. "They threw their candidates under the bus and put all their efforts into getting Marmer elected," said Jackle. Jackle, a top vote-getter who was first elected to the school board in 1993 and served for a time as its chairwoman, said she would push to have budget debates televised, something that wasn't done under Marmer's term. All agreed that taxes seemed to be the overriding theme in this campaign, but four budget referendums in the last four years also didn't help. But what swung the election Tuesday were the hundreds of people who showed up to vote at the wrong place, Republican Town Committee Chairman Hal Cummings said. Throughout the day voters went to Center 375 on Hartford Turnpike, the town building where all the budget referendums are held. Cummings had Republican campaign workers positioned at the building to direct them to their proper polling place. "The lines were 10 deep over there all day, and you can't vote there" in a municipal election, Cummings said. "If we hadn't been there to redirect them, they probably would've gone home."